Sadly, the metric of division is not "one studio for each of the seven seas." The development of a AAA video game is always a serious undertaking, and often one studio will divvy up the content and outsource some of the work to another studio. Ubisoft Montreal, primary developer of the Assassin's Creed series, is very familiar with this process - every game since the original Assassin's Creed has been a joint effort by two or more studios. For Assassin's Creed IV: Black Flag, the developers are getting a tad more ambitious - Black Flag will be the product of no less than seven separate studios' combined efforts. With so many cooks in the kitchen, it's quite a logistical challenge to keep the original vision of the game intact. Ubisoft Montreal is taking the lead again, and Ubisoft Singapore (the studio responsible for the naval battles in Assassin's Creed III) has earned a central role as well. The two of them will be focusing on the design of the single-player game, with support from studios in Kiev and Quebec. Meanwhile, Ubisoft Sofia is handling the modern components of Abstergo Industries and their continuing schemes. Studios in Annecy and Bucharest are in charge of multiplayer. Part of the challenge of dividing Black Flag's content involves its new sandbox design. 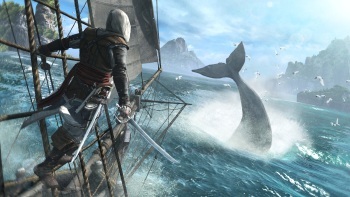 While Assassin's Creed III was clearly split into on-foot missions and naval battles, Black Flag aims for a more mingled style of gameplay. "It's a cohesive world," explains lead game content manager Carsten Myhill. "Whereas before we had a land game and a sea experience joined together, because we've created this cohesive universe we can't really split things up as simply as we have in the past, so we're going for more of a mission-based split this time." While it may sound like a surefire formula for a disjointed campaign, the developers at Ubisoft's assorted studios think they can pull it off. "We've adopted this multi-studio approach now since Assassin's Creed II so it's a well-oiled setup that we have," Myhill assures. "It sounds very complicated and I'm not saying it's not a challenge - it requires incredible talent and organization to get it done, but we know how to do it." We'll be able to see how well the seams are hidden when Black Flag sets sail on PlayStation 4, PS3, Wii U, Xbox 360, and PC later this year.